Add Some Color to your Glass Order! Accent your glassware selections with vibrant Custom Glow Colors. Available in ten electrifying colors, Custom Glow can be the perfect compliment to your total promotional message. 3190- 6 oz Champagne Glass w/Glow Stem 3.69 3.34 3.25 3.18 3.12 2.98 2" 2-1/2"
3147- 8.5 oz Wine Glass with Glow Stem 4.21 3.84 3.73 3.65 3.57 3.40 1-1/4" 3"
3115- 12 oz Brandy Glass with Glow Stem 4.86 4.46 4.32 4.22 4.12 3.92 1-1/2" 2-3/4"
4142- 13 oz Glass Mug with Glow Bottom 4.53 4.14 3.99 3.92 3.84 3.66 1" 3"
4110- 25 oz Glass Mug with Glow Bottom 6.96 6.46 6.24 6.08 5.92 5.60 1-1/2" 2-1/4"
2115- 16 oz Pint Glass with Glow Bottom 2.99 2.69 2.64 2.59 2.55 2.45 1-1/2" 2-1/4"
4109- 14 oz Glass Mug with Glow Bottom 5.75 5.29 5.13 4.99 4.89 4.64 1-1/4" 2-7/8"
It's easy to have your own Custom Glasses in any color you choose. 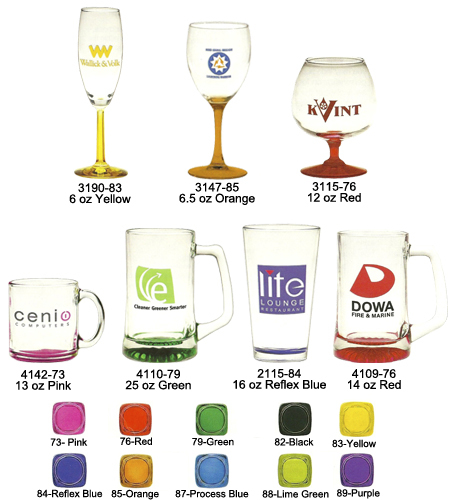 Simply choose your glassware, then choose one of the ten available glow colors and call 1-800-233-0828 to submit your order. You will receive your Custom Glasses in about 3 to 4 weeks. Rush delivery is available.